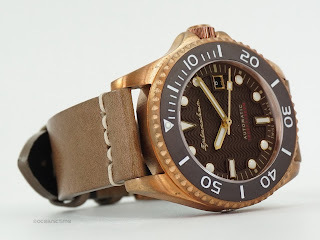 TESEI BRONZE This is the NEW Swiss Made, Tesei Bronze Edition from British watch brand, Spinnaker. Named after the Italian WWII naval officer, Teseo Tesei who invented the human torpedo, the watch is pretty much Italian in name only, safe for perhaps its leather strap which is hand-made in Italy. 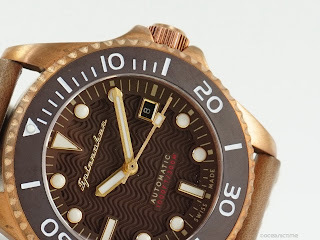 We could also argue that its use of bronze which was pioneered by the Italians qualifies it for an Italian name. SWISS MADE Spinnaker Watches are well known for their large collections of affordable nautical themed sports watches. I had the opportunity to review one in the past and was pleasantly surprised by what I found. HERE it is. 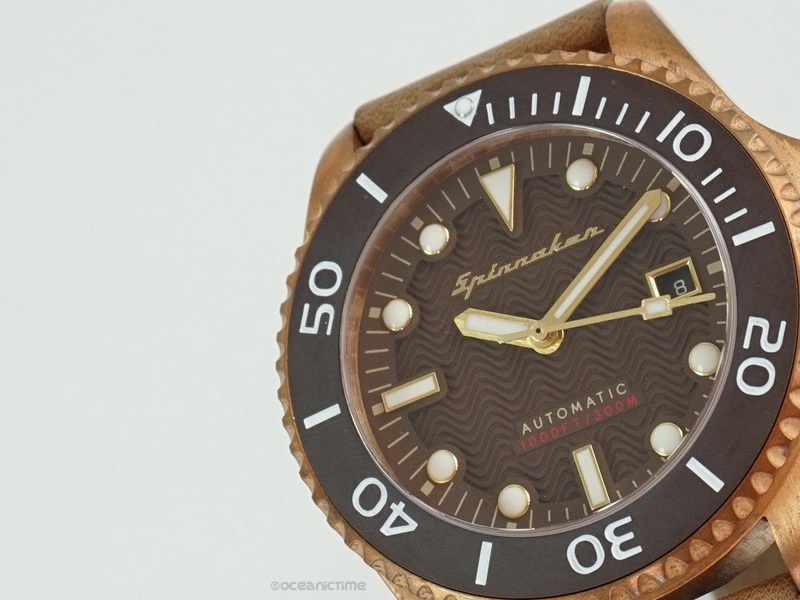 But make no bones about it, Spinnaker are a volume moving brand that are constantly releasing new collections. 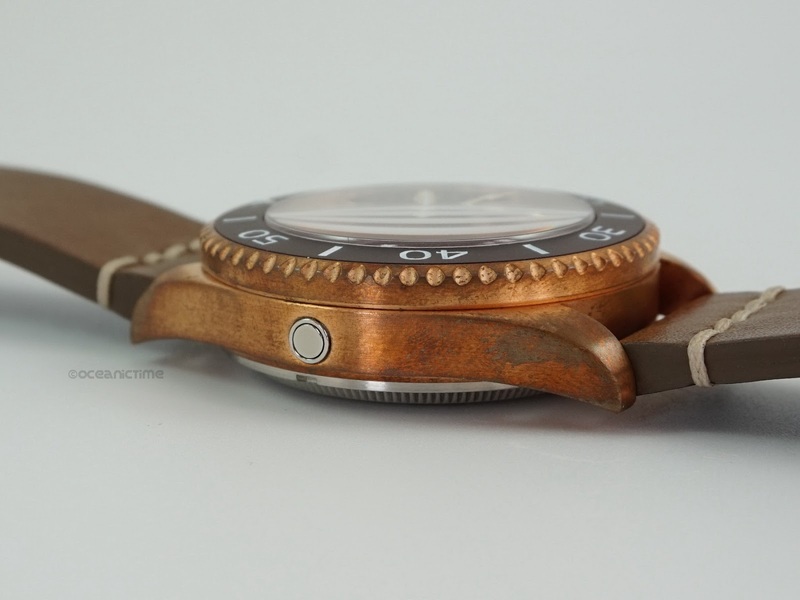 Their watches tend to be a little mass produced. However among them are one or two gems, historically inspired dive watches, nice looking but not quite on par with a good quality micro or proper entry level Swiss dive watch. Let's see how the British brand's first Swiss made outing compares. BRONZE The Tesei’s case is of course made from bronze. The particular alloy, though I am unsure of. But considering the amount of red in it, it is likely more copper based such as CuSn8. Some people (should I say geeks) do have their personal preferences. Mine’s Al bronze owing to its higher tensile strength. Aesthetically CuSn8 seems to be the more desirable of the bronze alloys. 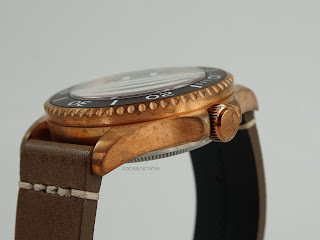 I mentioned earlier that, the use of bronze in watch making was pioneered by the Italians, if you want to read more on that, there's an article of mine HERE. 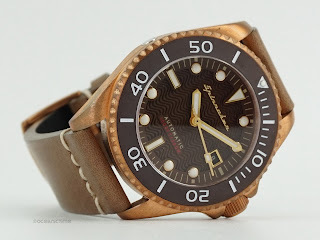 DESIGN The Tesei Bronze has a very safe design. 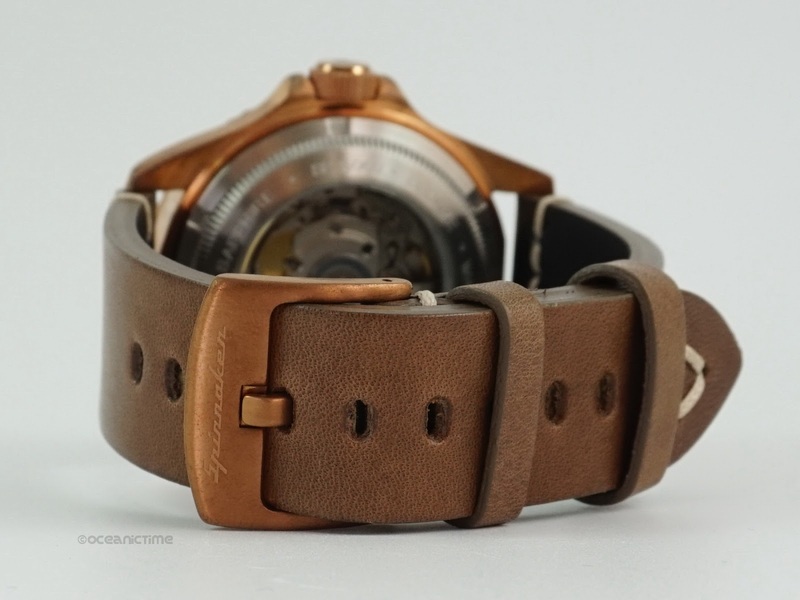 It uses a classically styled vintage case that we have seen on literally tons of different models from a wide range of brands. 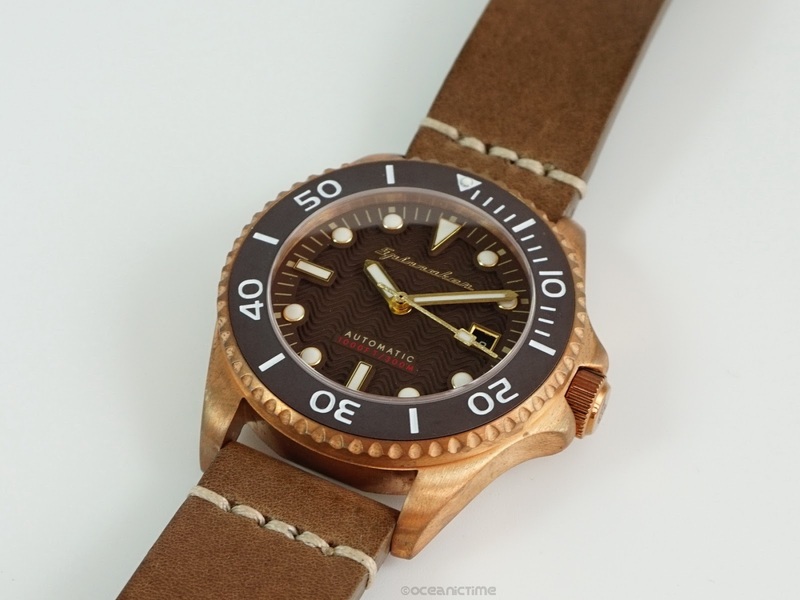 As potentially the wristwatch with the highest price-tag in Spinnaker’s portfolio, choosing such a sober design probably makes sense. But I personally find it totally unremarkable, sorry. That's not to say it isn't nice looking or that it's badly designed. It's just follows a tried and tested formula that has mass appeal; a simple design that you will likely never tire of either. SELLITA Powering the Tesei Bronze is (for the first time in a Spinnaker timepiece) a proper Swiss made mechanical movement. This is a 26 jewel, Sellita SW200 with a custom Spinnaker rotor. A lot of people, me included have likened the SW200 to the ETA 2824. 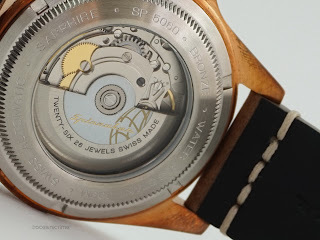 And it is a comparable movement, however it isn't quite as refined as an ETA, but to the Swiss movement snob it's always going to be more desirable than a Miyota 9015. 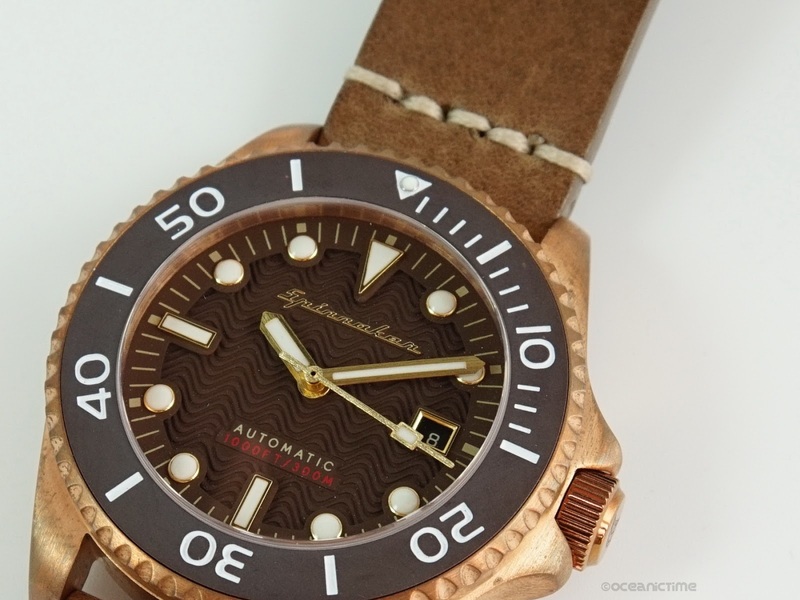 DIAL For this this particular variant (there are 3 others), the Tesei has a tobacco colored dial with gold applied indexes and handset. The dial has a textured wave-pattern to it and even a line of red text (as you do). Under the light the dial looks very pretty and dare I say it, quite luxurious. The gold dial elements give the watch the kind of premium feel you’d expect from a Swiss made timepiece. DIVER The Tesei Bronze is endowed with all your typical divers’ features. 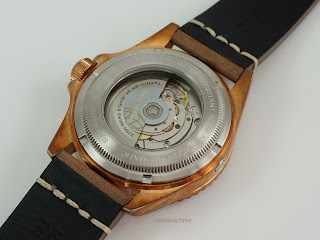 A screw-down case-back and crown, a Sapphire crystal, a unidirectional diver’s bezel, a Helium Escape Valve, Swiss SLN applied hands and markers and 300m of water-resistance. 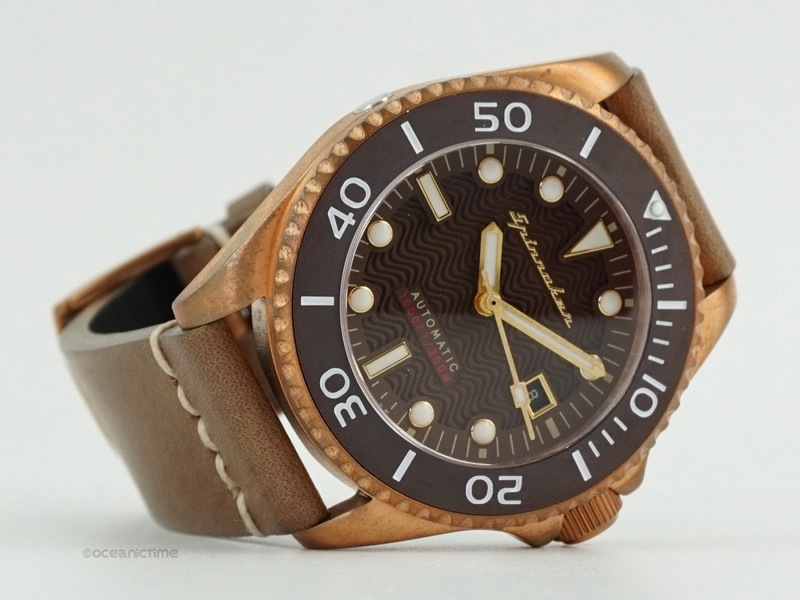 The diver's bezel is 120 click type with a brown ceramic insert and dive time scale. FIT n FINISH You can definitely feel a step up in quality compared to lower ranking Spinnaker divers. 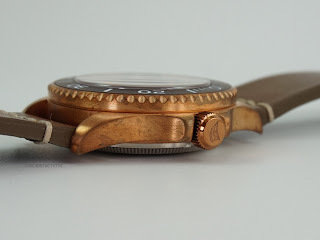 The Tesei Bronze has nicely finished surfaces, a tightly secured bezel and crown and plenty of nice details like the dial and its exhibition case-back with Sapphire window. 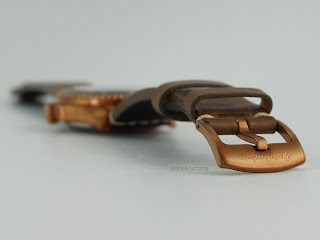 It's hard to fault; even going over the watch very carefully I couldn't pick any holes in it, even if I wanted to. However I do think Stainless Steel would have been a far better choice for the brand's first Swiss made watch as bronze can look a little messy in its early stages of patina (as this does) whereas steel always looks pristine out of the box. 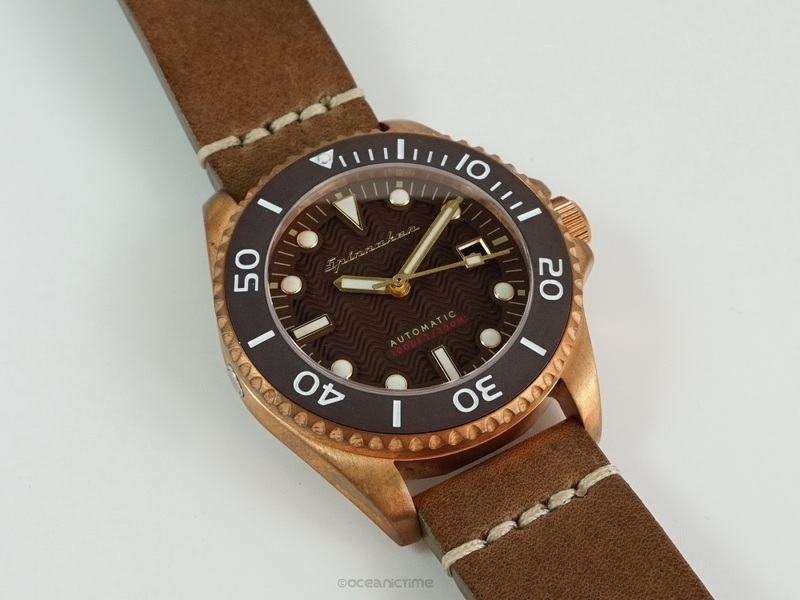 on the WRIST The first thing that struck me about this particular iteration is that as I'm quite sun tanned, the tobacco dial and bezel was literally lost on me. However you do get a lovely little twinkle from all the gold dial elements. 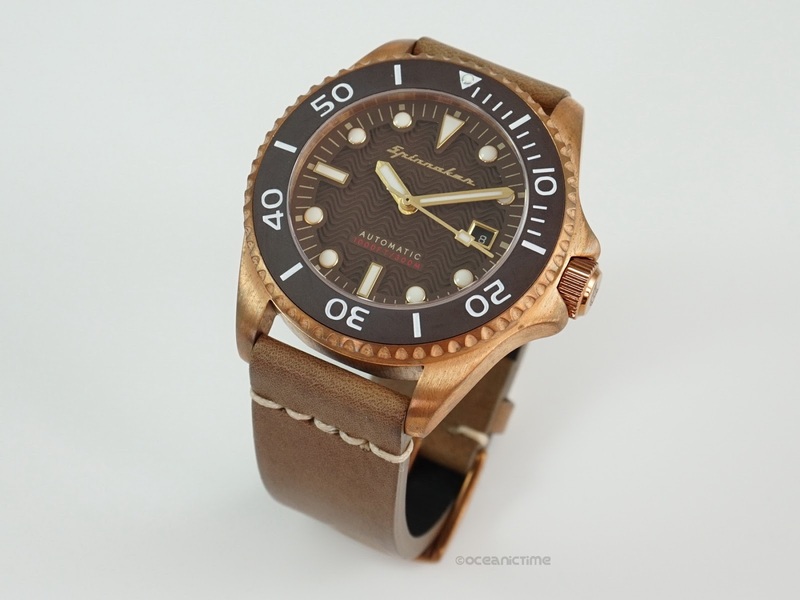 The Tesei Bronze has a 43mm in diameter case with a height of 17mm. The case diameter is fine but I feel 17mm is quite thick for a 30 ATM diver. ITALIAN I mentioned earlier that the Tesei Bronze comes on an Italian handmade strap. This is actually a really nice premium quality strap that is not only comfortable and good looking but is also water-resistant. It should hold up well over time. PRICE The Tesei Bronze Edition has a list price of 860.00USD. 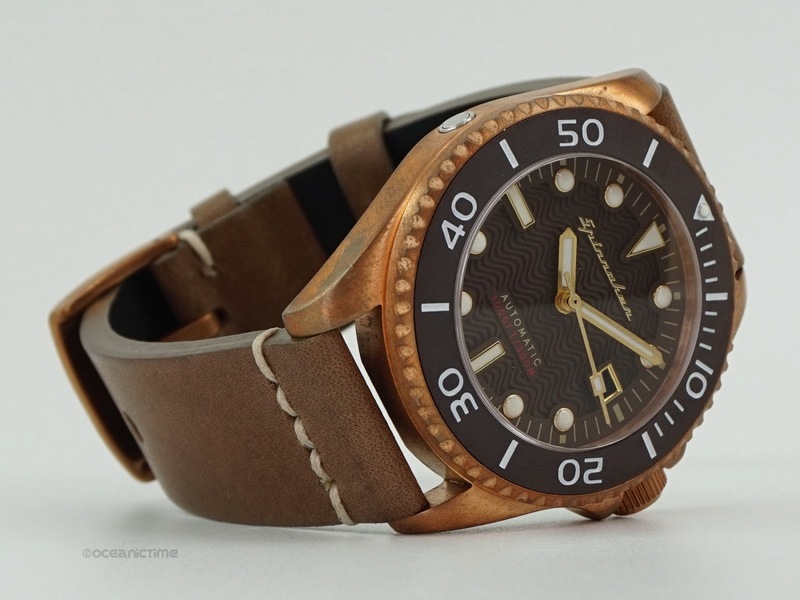 Correctly pricing a new diver in this current climate of crowdfunding is a tough one. Too expensive and no one bites, too cheap and it's dismissed. 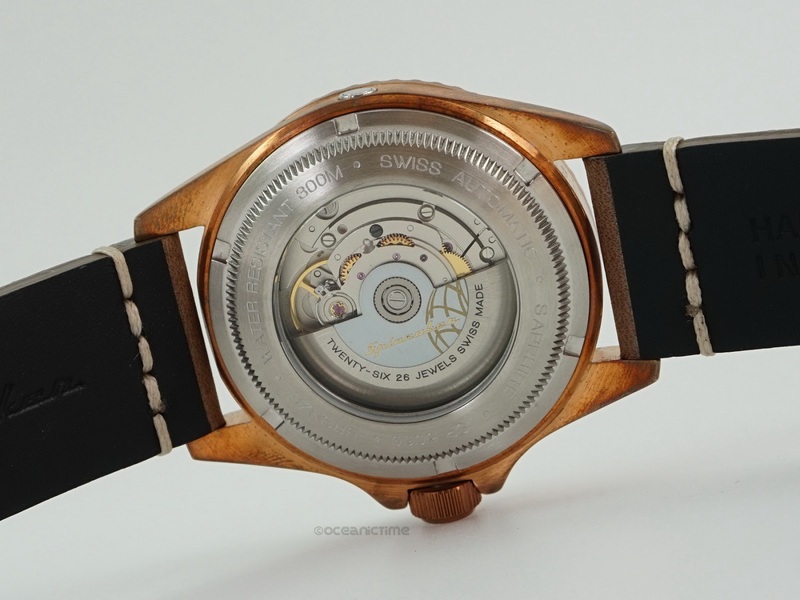 Obviously there is a premium for a Swiss movement, Swiss assembly etc. which reflects in its price. But other brands, like Steinheart for instance are also offering Swiss made for less and they have a much stronger brand image to boot. With that said, the Tesei Bronze Edition will likely be able to purchase with a discount which would even things out a little. Still 860USD is lot to play with. 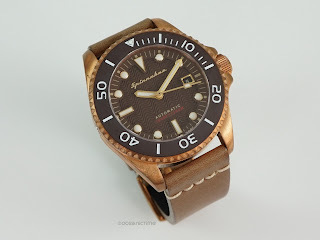 FINAL THOUGHTS I was delighted to review Spinnaker’s debut Swiss made watch. They have surely stepped up their game in terms of quality. 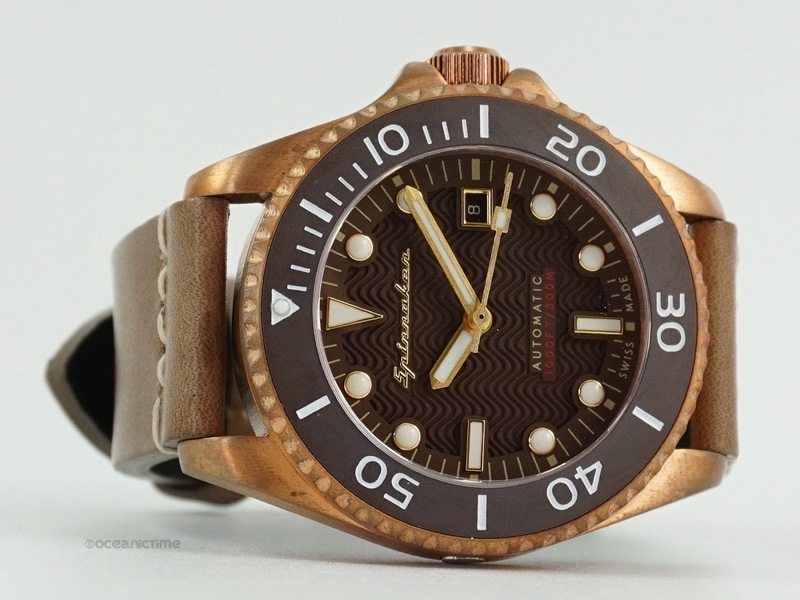 Could it go up against an established Swiss entry level diver? Probably not. A good quality micro? Yes, without a doubt. However I felt that the Tesei Bronze was lacking in emotion. 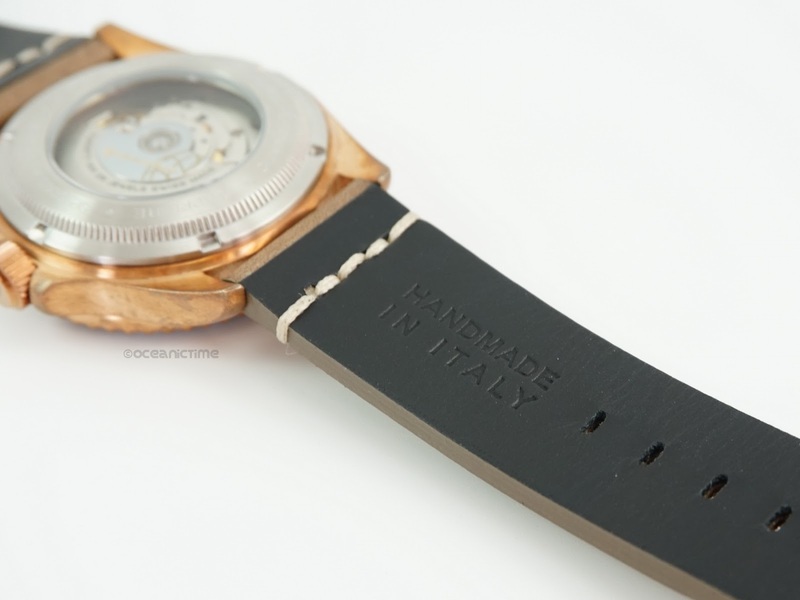 It's a very safe watch and despite its Italian name, the watch had a distinct lack of Italian flare. Perhaps for their next Swiss made edition Spinnaker could explore other more interesting vintage designs. And should strongly consider something in Stainless steel.